I organized POL 359 by topic rather than by week, which allows for more of the course to appear on a screen at any one time; it also exposes the underlying structure of the overall course in a meaningful way and corresponds to how the syllabus itself is organized. 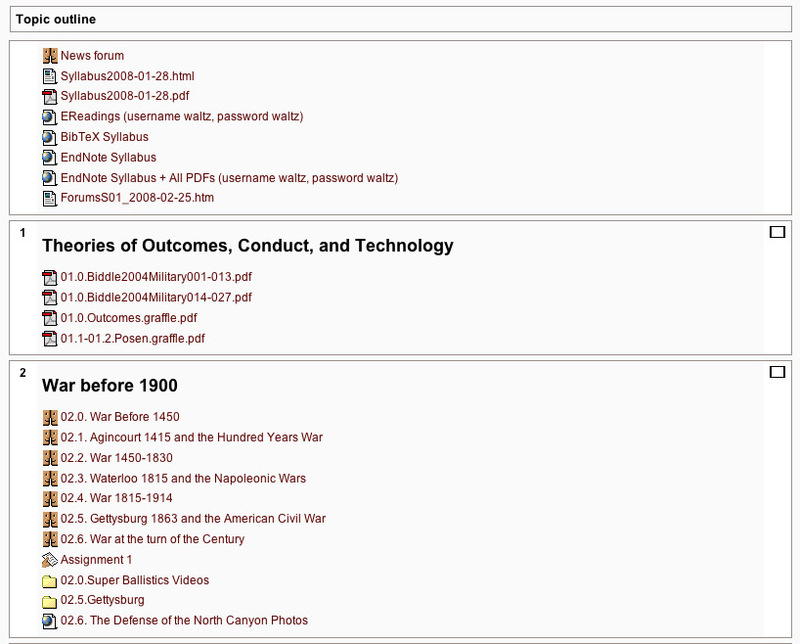 The supplemental materials (e.g., Super Ballistics Videos) are grouped together with the relevant parts of the course, and assignments are placed exactly where they are due (e.g., after War at the turn of the Century, but before the next section on War between 1900 and 1945). Additional readings or readings from books that haven’t arrived at the bookstore yet can easily and quickly be posted (e.g., Biddle2004), and important handouts are posted early and prominently in the course (e.g., 01.1-01.2.Posen.graffle.pdf). This also means that when I need to refer back to those handouts I can pull them up on the projector for everyone’s reference rather than having to count on them bringing them to class every day. Similarly, they provide a handy place to store short video clips to be played in class, so I don’t have to bring my laptop: e.g., the Gettysburg videos. Finally, important items that could be changed are placed at the top (Syllabus, Endnote bibliographies, etc. ).